Wow, have we had some snow here this weekend! Early last week we were dealing with an icy storm, but we managed to squeeze in a morning viewing of Disney's newest movie "Frozen". Might I just say that we loved it, and it might just be a new family favorite. So, as my poor hubby cleared all of the snow from our driveway today, I was in the mood to pull out my CTMH Frosted paper. I started this card by creating a Kraft cardstock base. I then cut a piece of that beautifully subtle snowflake paper from our Frosted paper pack and embossed it using a new snowy folder I just picked up at AC Moore. Next came a strip of the blue Frosted paper. 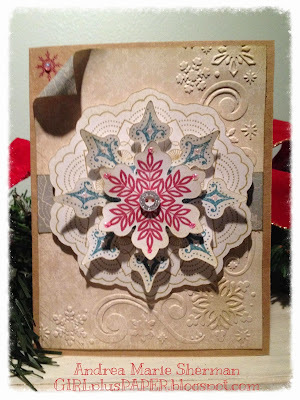 Then a whole bunch of stamping using the CTMH Classic Doily stamp set as well as the CTMH Snowflakes stamp set. And all of that stamping was done on shapes cut out on my CTMH Cricut cartridges Art Philosophy and Artiste. 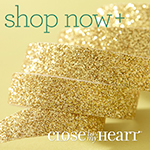 Some foam tape to pop up my images and some bling completes the look. I hope you like it!